There’s no other fungicide quite like Polyram® DF, formulated as hollow granules with 14% zinc content. The granules dissolve quickly and are easy to mix. The use of zinc makes it much softer on the crop than a copper-based product like mancozeb, with an added nutrient benefit. The result is a better crop finish and extra value in the market. 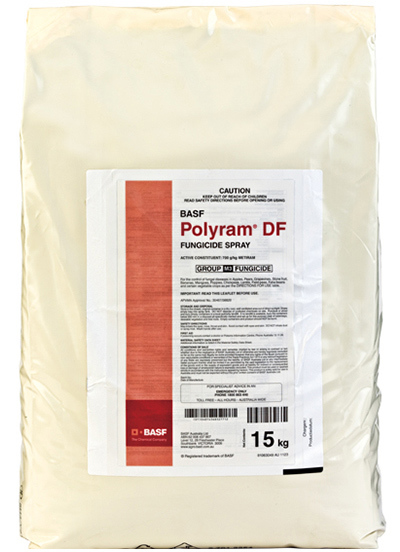 Polyram® DF is a non-systemic, preventative fungicide that forms a protective barrier on the plant’s surface. Polyram’s active ingredient, metiram, kills the fungus after it has germinated from the spore and before it penetrates the plant. Within the fungal cell, amino acid production is interrupted and the cell stops growing. Once the fungus has established itself within the plant, Polyram – like many other protectant fungicides – is ineffective. Polyram is also a softer and safer option for use in selected Integrated Pest Management (IPM) programs. It has a strong beneficial insect safety profile and is compatible with most insecticides and other fungicides. However, to be sure of compatibility with any particular product, check with your local dealer first.